There are some things that we never outgrow. One of those things, for me, is playing dress up. You can call it dressing up. But let’s be real. Sometimes it’s just playing dress up. I wonder if you can relate. That’s why getting this skirt as a gift from a sweet friend put a big smile on my face. It isn’t something I would have bought for myself. It doesn’t really fit in with my work environment nor is it my usual date night look. But it is soooo much fun! I’ve been noticing that this silhouette is on trend at the moment. One brand that is really taking up the look is Ted Baker. Every time I pass by one of their store windows, I see several of these puffy ballerina-like skirts. They are the ultimate in feminine. But they can be tricky to pull off. I’ve tried on those silk Ted Baker skirts with pleated waistlines. The waist, in fact, is my favorite area to highlight. But unfortunately, those pleats visually add weight there. What typically makes these skirts challenging for yours truly (of shapely legs) are above-the-knee hems. The silhouette becomes dowdy. Or let me put it this way: they make me look more like the elephant at the circus than the tightrope walker. When I tried on this particular skirt, however, I was intrigued. It works! The area below the waist is not bulked up with stiff pleats. That’s because it’s made of tulle, a fabric that’s trending lately. And the hemline hits my leg at the most flattering spot: that narrow part just below the knee. Since red and black are already a dramatic pair – hence, perfect for “dress up”! – I could have styled the skirt with a black top. But, I decided to go for the gusto with more red. Since this outfit reminds me of a flamenco dancer, I wore these sandals which to me, give off that same vibe. I hope you like my puffy tulle skirt dress-up outfit. When this post comes out I will be with Mark in Spain (and then Italy). That’s why you may have noticed that we’re publishing only twice a week these days – it’s only temporary though! I hope you won’t mind a slight delay in response to your comments. Hasta pronto and ciao! I think the skirt is gorgeous! So stylish and elegant! Stunning is the word for you girl! Totally besotted with your skirt! I think you look fabulous in this outfit. 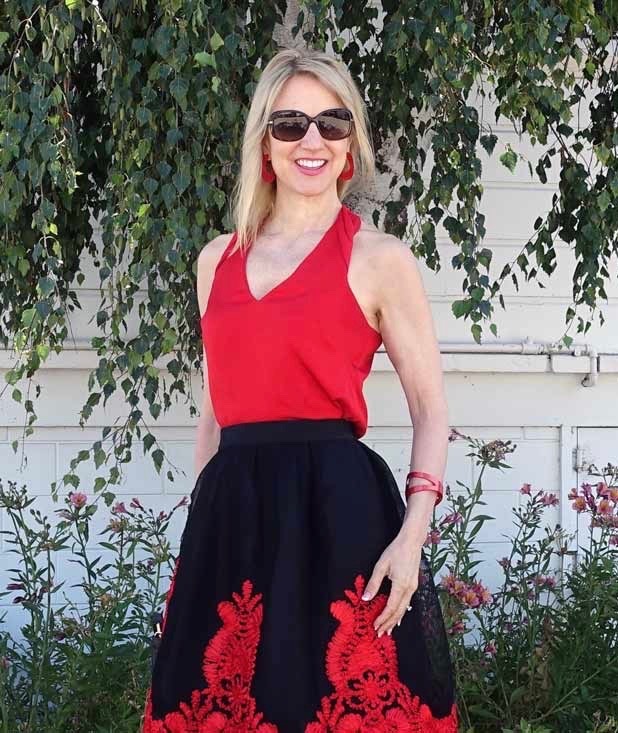 I love the skirt and the red lace on it! That bracelet is so beautiful. Love all the details! Such a lovely skirt!! Looks good on you! I love how feminine this skirt is! The bright red is stunning on you! Playing dress up is always the best! Oh wow Janea you look absolutely gorgeous! I love the skirt and all the pretty details. This skirt is so gorgeous- the embroidery over the tulle is such a cool feature! The skirt is pretty awesome! Such a lovely look!